The presentation in Practices is over with. Sweet Studious Boy was preparing with his group at the same time my group was going over our notes, so he’s evidently decided to stick it out. I’m glad he didn’t drop the class. 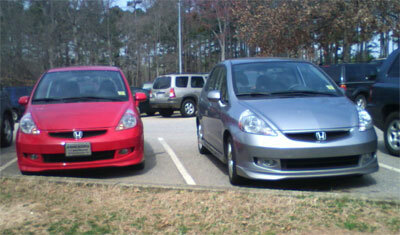 After we’d done our presentation I was finished for the day, so I headed back to my little Honda Fit—and discovered a little red Fit had parked next to my little gray Fit. They were so cute I had to take a picture. Well, maybe it was just an excuse to take a picture of mine. Got my Intermediate test back, and our Controls instructor posted the grades for that test—A’s on both. Holy crap! I was figuring I’d get a C on Intermediate, or maybe a B. And now the spring break week stretches ahead of me. Plenty of time to work on the Practices project, the Ethics paper, the Intermediate and Controls extra credit projects, and maybe get ahead on the Software classwork a little bit. Er… wait, wasn’t there supposed to be a break in there somewhere? Oh, well.